Listen. This resort is top notch! There is a reason this resort was rated the #1 resort in Eastern Mexico. It's located on one of the most beautiful stretches of beaches in the Riviera Maya and offers ultimate luxury. From the gourmet dining options, to the spacious suites and villas, El Dorado Maroma leaves no stone unturned in terms of luxury. The icing on the cake are the palafitos (over-water bungalows) that offer glass bottom floors, ladder access to the ocean, and a personal butler. My clients LOVE this resort! It's located on the beautiful Bavaro Beach in Punta Cana and each room comes with personalized butler service. 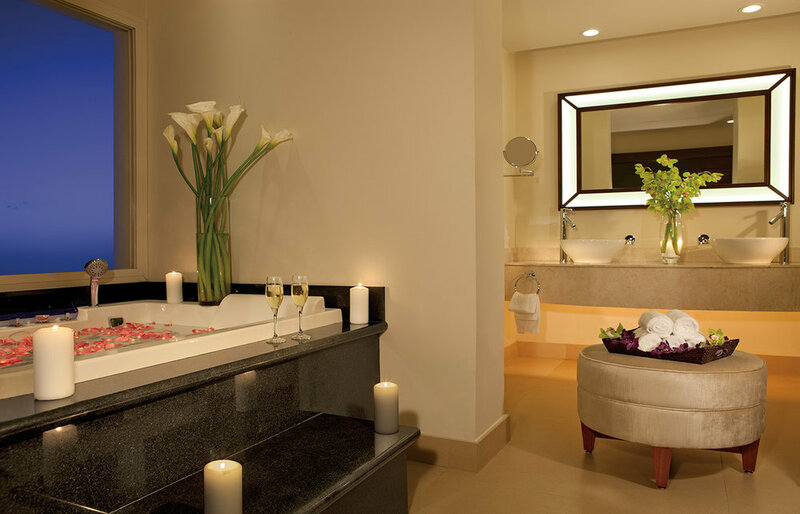 One of the best offerings at the Iberostar Grand Hotel Bavaro is the spa. Couples enjoy beachside massages, turkish baths and private, in-suite services. Secrets resorts are another client fave. 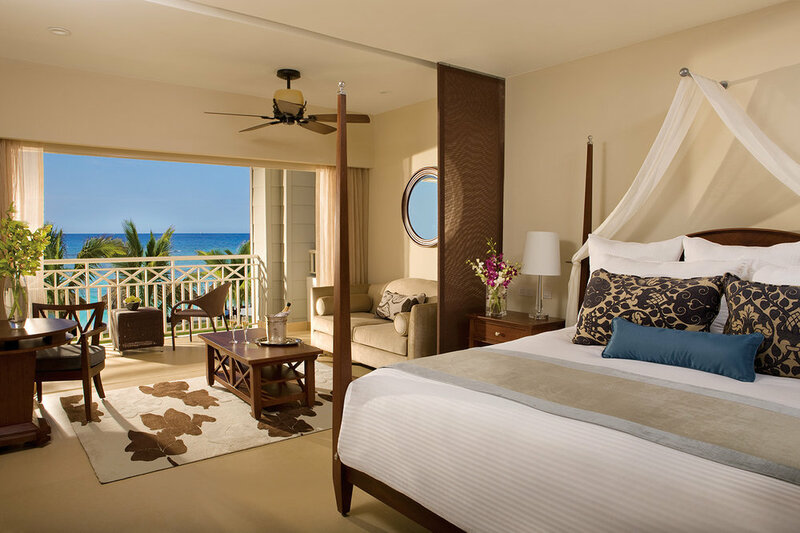 Secrets St. James is a beautiful resort that offers amazing honeymoon amenities like, private candle-light dinner on the beach, spa treatments, breakfast in bed, and free anniversary nights. Also, Secrets resorts allow you to experience all of the dining and nightlife at nearby Secrets and Sunscape resorts, so there's guaranteed to never be a dull moment. Ranked the #1 hotel on Trip Advisor, the Unico all-inclusive resort is the epitome of luxury. If you're looking for a resort where you can truly kick your feet up and relax, this is it. The gourmet local cuisine, holistic spa treatments, and spacious rooms allow honeymooners to truly decompress and live in the moment. In addition to honeymoon extras like breakfast in bed and welcome bottles of mezcal, you can also enjoy a free room upgrade when you book your honeymoon with me! Sandals all-inclusive resorts paved the way for many resorts today, and the beautiful beachfront Sandals Royal Bahamian is no exception. Honeymooners can expect the ultimate luxury treatment as soon as they land at the airport with included Rolls Royce transfers and a private butler welcoming you at the resort. In addition to unlimited fine dining and premium spirits, Sandals Royal Bahamian also includes visits to a private island where you can take part in land and water activities, or just lounge in a secluded area on the island. Jade Mountain Resort offers some of the most luxurious and breathtaking views in the Caribbean (with a price tag to match). With all of the rooms missing the 4th wall, honeymooners can expect the luxury of private infinity pools, expansive balconies, and jaw-dropping mountain and sea views. This beautiful resort also offers romance packages that include private tours, spa treatments and free anniversary nights. One of Sandals newer properties, this luxurious Jamaican resort also boasts the high quality Sandals amenities, as well as its own private island exclusively for guests to enjoy. For the ultimate luxury experience, honeymooners can book one of the Caribbean's first over-water bungalows. These accommodations offer glass bottom floors, over-water hammocks, plunge pools, and private boat transfers to the main resort. Are you planning a honeymoon or anniversary soon? Click below to learn more about our Honeymoon/Anniversary packages. Grab your free Honeymoon Planning Checklist to help you get started! Success! Now check your email to get your Honeymoon Planning Checklist. Love my blog posts?  Then you'll enjoy my newsletters full of travel inspiration and exclusive deals and discounts. Check the box on the left to opt-in!